Heavy, moist soils in lawns. May, June, July, and August. Long spreading stem with rooting runners. Dark green Leaves with 3 lobes; the middle lobe connected to a long stalked base. Leaves are deeply toothed, slightly hairy, with occasional light coloured spots. Golden yellow flowers with 5 shiny petals. Creeping buttercup leaves and flower, photo / picture / image. Can quickly take over a lawn if left to spread. Spreads not only by seed, but also by runners (see image below) and chopped up plant fragments. Ensure adequate soil drainage when creating your lawn through the use of free-draining soil and the installation of drains at the outset. Improve current soil drainage through spiking, aerating, and sanding. Ensure your lawn is well fertilised as this promotes strong grass making it difficult for buttercups to become established. Apply lime to your lawn. Occasionally rake your lawn with a sprung rake/scarifier machine before mowing. This will loosen trailing stems and runners, allowing you to mow them up. Ensure you have a well sealed grass box on your mower to prevent chopped up buttercup fragments dropping and rooting. To check growth apply a Sulphate of iron/lawn sand. To check growth apply a 3 in 1 lawn feed/weed/mosskiller. To kill apply selective herbicides containing the active ingredient MCPA. This is available in the product Verdone Extra Liquid Lawn Weedkiller. To kill apply selective herbicides containing the active ingredient 2,4-D. This is available in the Bayer Advanced lawn Weedkiller and for spot treatment in the product Doff Lawn Spot Weeder. Spot treatment can also be carried out using a Glyphosate wax stick. Notes on selective lawn weedkillers. Applying a lawn fertilser to your grass approx two weeks before applying selective lawn weedkillers will improve results. Weedkiller application is most effective while the weed is actively growing, between the leafing to flower stage of growth. For best results, apply selective weedkiller to the lawn on a day forecast to be dry. Apply on a calm morning (no drift) once the dew has dried. With most lawn weedkillers expect to apply two or three applications at 6 week spacings to rid your lawn of the weeds and the regrowths from their seeds. Always read carefully the instructions supplied with the weedkiller, and follow them to the letter especially regarding protective equipment and the care of children and pets. 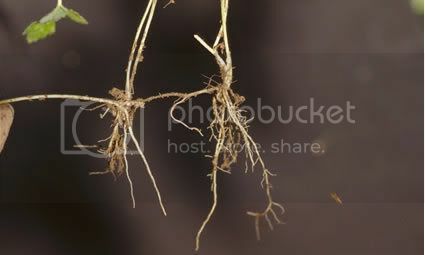 Creeping buttercup spreading by runners and white roots, photo / picture / image. Please note that Irishgardeners.com does not advocate the removal of plants, instead, this forum encourages planting and preservation. However, there are occasions where a plant becomes a problem or a weed within the garden for certain people. Be aware that Creeping buttercup is beneficial to lots of insects. Please at least think about this before you remove the plant from your site. Any queries or comments on Creeping buttercup, please post below.